History will be made in Netanya, Israel at the 2018 Men’s World Championship for many reasons ~ the largest number of teams to ever compete in this event (46) ~ an inaugural Host World event for Israel ~ it will be the most watched men’s lacrosse event ever to be broadcast on Sport 5 in Israel, ESPN in the United States, and streamed to a world-wide audience ~ and participating will be the first woman from the Asia Pacific Region to referee at a Men’s World Lacrosse Championship in the history of the sport! Congratulations to Natsumi Sasaki from Japan on her selection! I had the opportunity to first meet Natsumi when I attended the 2018 Hong Kong Open at the end of April this year, and over the four days of the event I came to witness a young lady full of potential, growing in confidence, and earning her stripes as a respected Men’s Referee. (Fiona) Where & when did you start to referee? 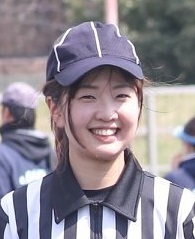 (Natsumi) I joined the lacrosse team of Tsukuba University as a team staff in 2011 and started to referee in 2012 in the Kanto area. So, I’ve never played the game. In fact I had never watched a lacrosse game until I enrolled at the university. In other words, lacrosse was completely new to me when I started my studies at Tsukuba University. (Fiona) Who got you involved in refereeing? (Natsumi) I became interested in refereeing by my senior team staff member. She was also a referee and had never played lacrosse, but participated actively in it. (Fiona) What do you love most about being a men’s referee? (Natsumi) I don’t really know why, I just love men’s lacrosse and refereeing the game. But thanks to it I’ve made many friends across Japan and all over the world, and have encountered many new/different points of view as a referee. It is a great thing for me and something I really enjoy. (Fiona) What events have you refereed at? I’ve done national championships of college games and the International Friendship Games in 2017 and 2018 in Japan. As for overseas events, I joined the Hong Kong Open in 2018. This was my first overseas trip for refereeing. Israel will be my first international event. (Fiona) Did you ever play any sports? (Natsumi) Yes, I had played basketball for around 10 years. But now I don’t play any sport. (Fiona) Do you have any message for other women wanting to take up refereeing the men’s game? (Natsumi) I’m really very honoured to be the first woman from the Asia Pacific Region to referee at a men’s lacrosse world championship. I would love everyone, regardless of gender, to get interested in and enjoy the men’s lacrosse game and also referee. And of course I would be happy if my challenge in joining the men’s lacrosse world championship can lead to other females taking up men’s refereeing. My hope is that lacrosse can develop in the Asia Pacific region more and more.